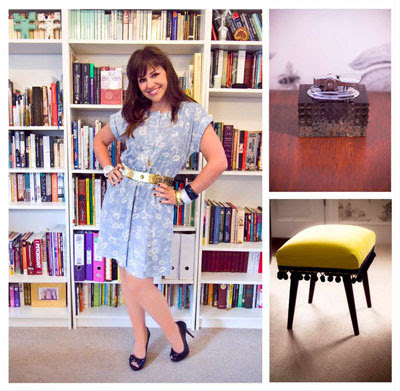 More lovely visitors' finds this month! As always, you can click on the photos to see their original source. 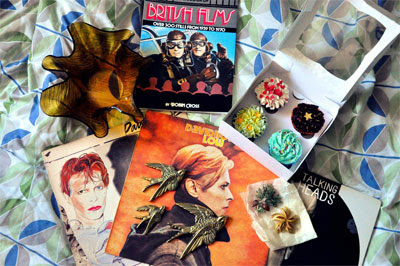 Jess Campbell shared her fabulous haul on Facebook: "Bowie - Scary Monsters, large amber handkerchief bowl, Corrie wall birdies, booky, Bowie - Low, mint chocolate [cupcake], red velvet [cupcake], fir tree brooch, gold swirl brooch, vanilla [cupcake], chocolate orange [cupcake! ], Talking Heads - Stop Making Sense." UPDATE! Jess wrote a fabulous blog review of the fair which has really knocked us out! Sadly, @AgnesDarling couldn't take a stall at this month's fair, but she did manage to nip over as a visitor this time! 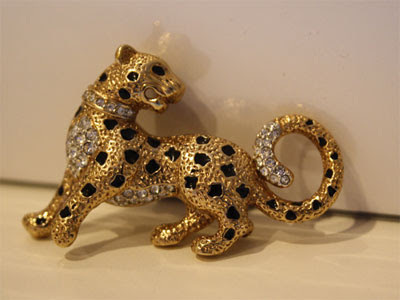 : "The start of a new collection for Josie. 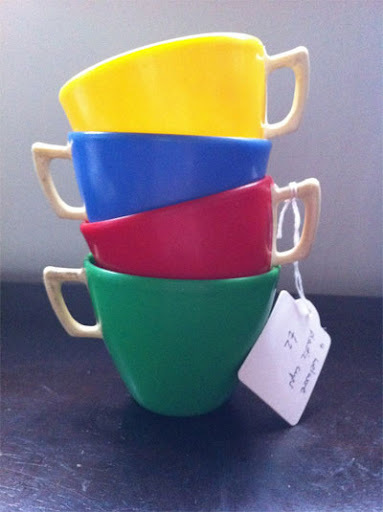 I picked these cheeky chappies up at @Vintage_Village today." 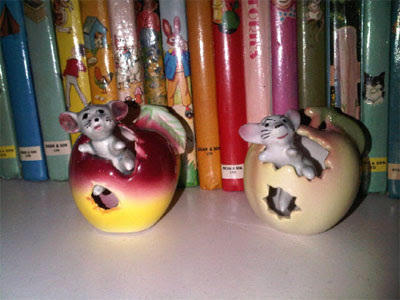 These cute mice came from Parrot in the Pantry and All Our Yesterdays. 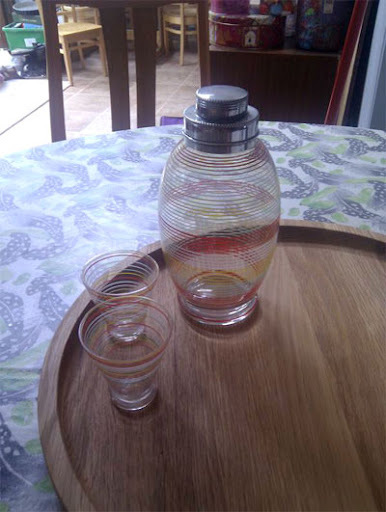 @OldFashionedSus: "these cheerful plastic cups caught my eye for £2." Read more on her blog. @Anne_L_Kershaw: "This is my stash of Vintage Village Goodies. The glass table lighter is from Norwegian Wood - the lovely lady and gent on that stall were particularly interesting and helpful. The only problem was wanting everything they had and having to limit ourselves to only one treat. The footstool is handmade by Imogen Peers and is simply fantastic. The dress I am wearing is my new best thing ever to wear." 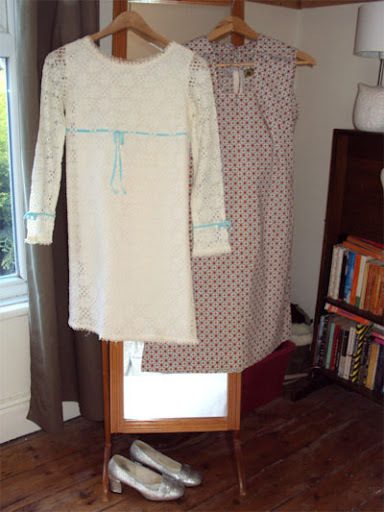 You can see Anne Louise's Finds of the Fair right here. @wifenotlodger: "Cocktails at mine! Chin chin.Thanks @Vintage_Village." @SBarryM: "Need to stop buying things for the house I don't have yet. Good buy from @Vintage_Village though." @LittlestMy: "My 60's numbers from @Vintage_Village. Tried on and bought within an hour!" 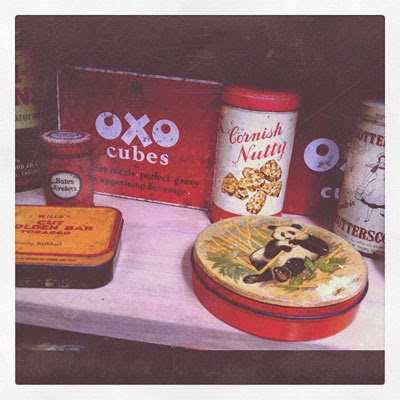 @nicolaridings spotted these lovely old tins. @deadmanjones is our first male visitor to share his finds (hooray! 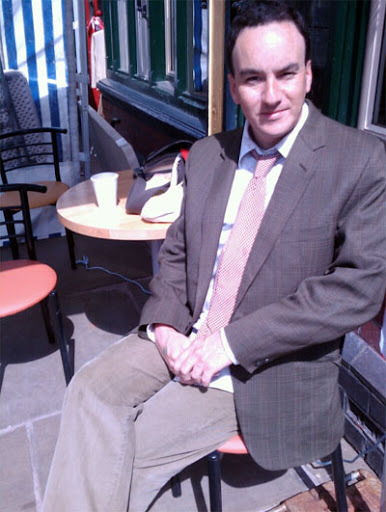 ): "Found christian dior tie to go with suit @Tailorbird1 fixed up for me at @Vintage_Village." (Photo by @nackuk). 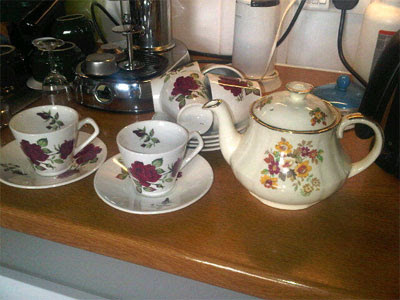 @meganthomasillo: "Am loving my new teapot, egg cups and Jaguar brooch from todays @Vintage_Village." 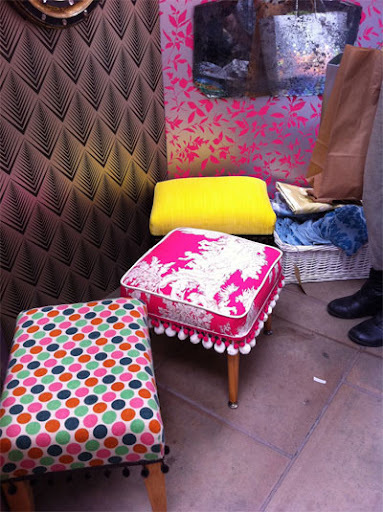 @OldFashionedSus: "this stall was selling footstools and mirrors both of which were rather fabulous! This lady had just started doing these so hadn't a website, she wanted to see how they went down - I think we can safely say they are a big thumbs up!" There's the full story here. Lal Davies posted this shot of her finds on Facebook. We may be seeing more of her . 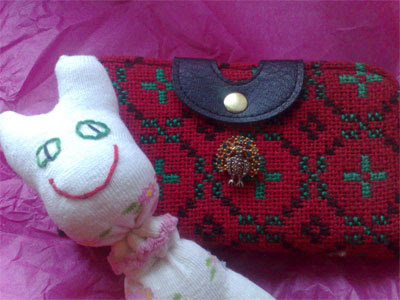 . . : "Vintage Village Virgin here, reporting in ... stash included Welsh blanket-style purse, peacock brooch, sock creature (her pink friend is tucked up in bed with my 5 yr old). 'I loved VV so much I bought the company' Well actually no, but I was inspired to 'get a room (stall!)' myself, so look out next month! 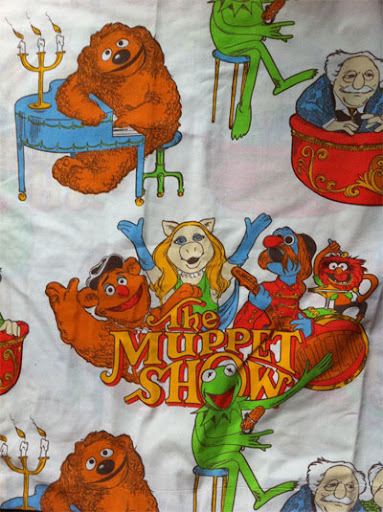 You might remember this Muppet Show fabric from last month's Visitors' Gallery! Let @OldFashionedSus explain: "The lovely Lady, Behave! and I did a bit of a fabric exchange - she brought this super Muppet Show fabric (ideal for the munchkin) I brought some of that quilted stuff I got from the car boot a couple of weeks ago." More here. 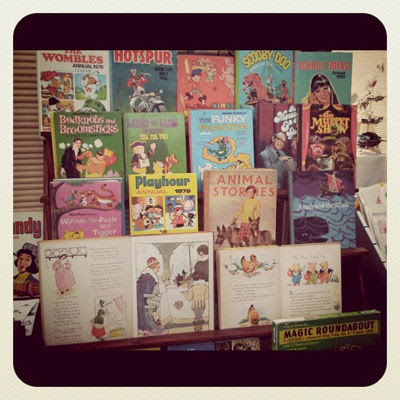 @nicolaridings: "Lovely old annuals from the VE themed vintage village." 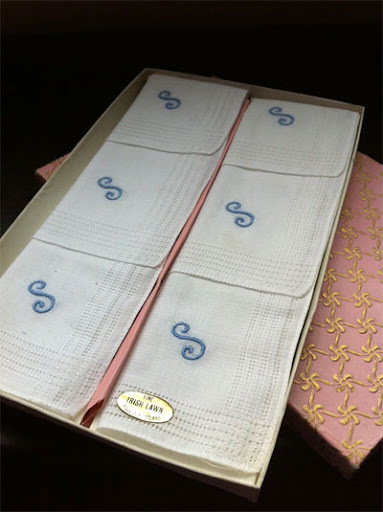 And here's @OldFashionedSus again with some delightful monogrammed handkerchiefs: "how could I walk away from these with my initial embroidered in blue!! Never been used and a bargain at £5." Get the full story.